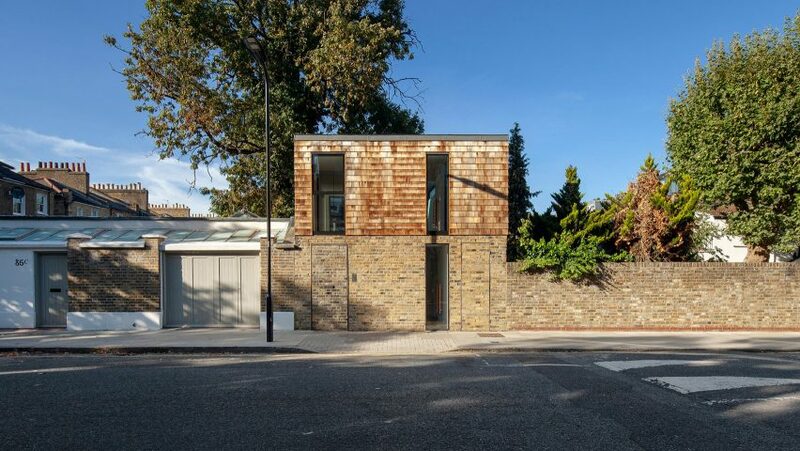 Designer Marta Nowicka has built a three-storey house on the site of a former garage in London's Dalston, featuring walls clad in cedar shingles. 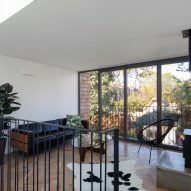 The Gouse – a combination of the words house and garage – stands on a site that Nowicka bought online "without even seeing it". 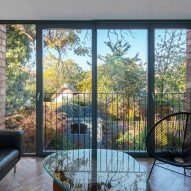 The plot measured just 45 square metres, surrounded by the back gardens of Victorian terraced buildings and facing onto a road. 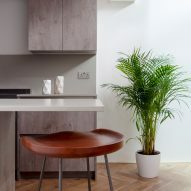 The designer managed to squeeze a three-bedroom house into this small space, containing 126 square metres of floor space across three storeys. 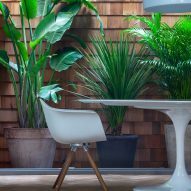 These include a basement cut through by light wells, glass floor sections and a "living wall" on the first floor that allows the creation of an indoor-outdoor living space. 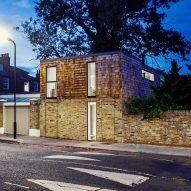 The focus of Nowicka's design was to retain the "end of garden character" of the garage, but improve the way in which the building met the street. 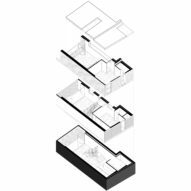 As well as addressing this balance, as Nowicka termed it, there was also a sense of introducing the materiality and "random contents" of a shed back into the new building. Previously a set of wooden garage doors created a break in a yellow stock brick wall. The new street elevation reinstates and continues the brick wall, forming the house's ground floor with a "secret yellow brick door" and a slim window. 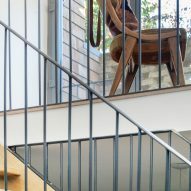 Inside, carefully framed views make the most of the house's neighbouring gardens. 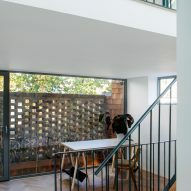 From the entrance, a corridor leads past a bedroom to a glazed wall facing out onto a small exterior space enclosed by a perforated brick wall. 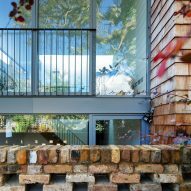 The master bedroom sits on the first floor, which is clad in cedar shingles and appears to sit atop the brick wall, in a nod to the old shed. 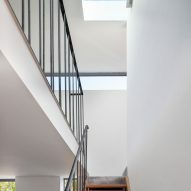 Illuminated by skylights, a thin picture window provides views of an adjacent ash tree. 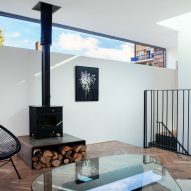 In the basement, the dining area and kitchen opens onto a terrace, clad in cedar shingles that bring what Nowicka describes as "the gentle scent of musky woodland". 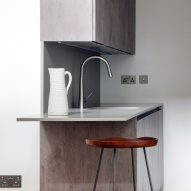 The interior materiality is again inspired by the old shed. "Inside a shed you’d expect to find wood off-cuts, logs, rush metal parts, copper pipe and plant pots…these elements influenced the interior palette", said Nowicka. 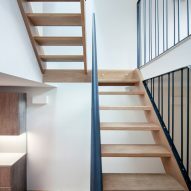 Herringbone oak floor and timber stairs referencing a ladder bring a functional, slightly industrial feel. Meanwhile a wood burner in the basement creates, as Nowicka described, "nostalgia, warmth and a smokey scent akin to the burning of autumnal leaves". 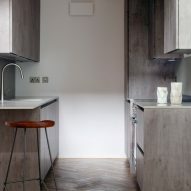 Nowicka completed the project for DOM Stay & Live, a property rental company she runs, which offers stays in architect-designed properties. 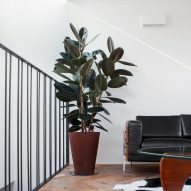 Other residential projects that Nowicka has designed for DOM Stay & Live include the conversion of a former St John's Ambulance Station in Rye, East Sussex. Photography is by Voytek Ketz.